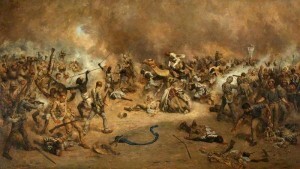 The Battle of Tofrek was one of many actions undertaken by the British forces against the Mahdist forces in the Sudan. Originally the objective had been to relieve General Gordon in Khartoum but by January 1885 that city had fallen to the Mahdi’s army and Gordon had been killed. Even with Gordon dead, the new mission would be to retake and hold Khartoum. The best approach remained a southward one along the Nile. The Nile, however, had a number of natural obstacles and it was thought a rail line across the desert from Suakin to the river would solve the difficulty of supply. To secure Suakin and start the rail line westward, a combination of British and Indian troops were sent under the overall command of General Gerald Graham. 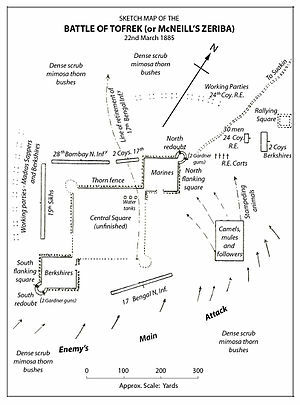 After an initial mission to Hashin on May 20, 1885, Graham sent part of his forces, under command of General John McNeill to establish a series of supply depots, in the form of zeribas (an improvised stockade made up of thorny mimosa trees) near Tofrek. McNeill’s forces included 2 squadrons of cavalry (one of the 5th Royal Irish Lancers and another of Mounted Infantry), the 1st Battalion of the Berkshire Regiment, a battalion of Royal Marine Light Infantry, the 17th Bengal Infantry, the 15th Sikhs, the 28th Bombay Pioneers, one company of Royal Engineers, one company of Madras Sappers, and 4 Gardner machine guns manned by naval crews and Marines. The contingent also had a large number of animal transports (mules and camels) which would later prove problematic. Initially McNeill was to establish 2 zeribas but the terrain and difficulty in controlling the large number of animal transports forced McNeill to concentrate on one zeriba. The construction of the zeriba consisted of a large square to contain the animals and two smaller squares on the northern and southern corners of the larger square. The smaller squares were built first and manned by the Berkshires and the Marines while the larger square was constructed. As McNeill had advanced from the east, the squares were constructed from the westward first. Just before 3 pm, scouting cavalry reported the Mahdist forces to the west and south. As the troops were forming up in defense, the remainder of the cavalry returned with the Dervishes close behind. At least one account says that the returning Lancers moved through the 17th Bengal Infantry as they were forming their firing line. The 17th fired a ragged volley and then broke. Two companies of the 17th rallied to the Berkshires, some moved to join the 28th Bombay Infantry while the remainder fled to the unformed central square. The vast number of animals within the enclosure then panicked which only added to the chaos. In the end, the British and Indian troops held off the Dervish attack but it was a near run thing. 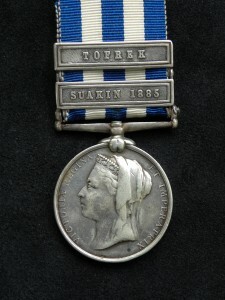 The Berkshires were renamed the Royal Berkshire Regiment for their efforts that day. The battle also showed the difficulty in conquering the Sudan and made it much easier for the British government to delay the conquest of the Sudan. It would not be until 1898, under General Kitchener, that the Mahdist forces would be defeated in the Sudan. 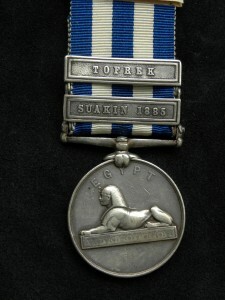 The medal shown is to Sepoy Ram Lall of the 17th Bengal Infantry. Note that this issue has the undated reverse. While most Egypt medals are engraved in distinct style of engraved capitals, the ones issued to the Indian Army are often engraved in the running script typical to the later medals of the India General Service medal 1849-1895. 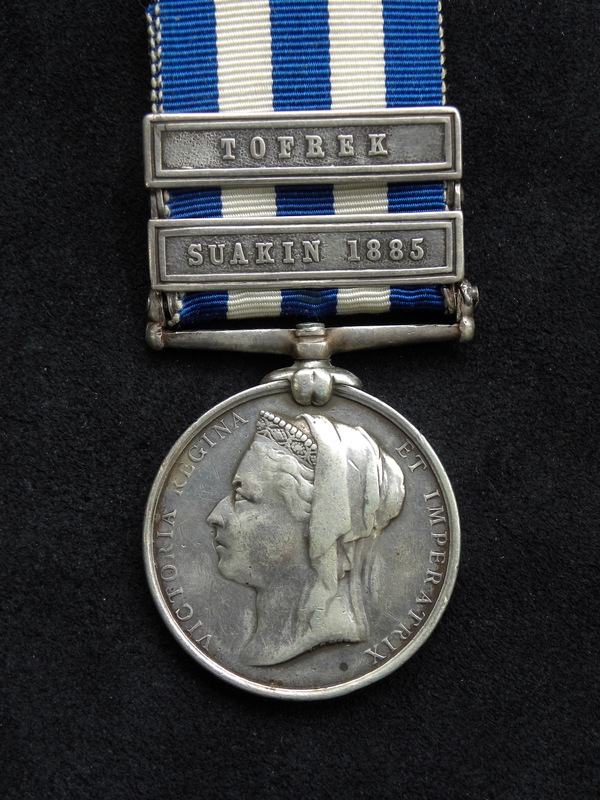 As noted in my previous blog entry about the bronze medals, it is extremely difficult to research medals to individual Sepoys. Records, if they exist, are not available to researchers. Medals to Jemedars and Subedars (Viceroy Commissioned Officers) can be researched through the India Army lists but these records are only a tantalizing bit of information about these men.